Pale golden amber color. Aromas of geranium, violet confit, underripe mango, and vanilla dulce de leche with a satiny, vibrant, dry-yet-fruity medium body and a peppery, captivating, medium-length green pear and cherry taffy, sweet honey, fine leather, and coriander and coconut shell finish. A sophisticated, floral, rye-lovers rye that will sit happily in classic cocktails or a sipping glass. Bottom Line: A sophisticated, floral, rye-lovers rye that will sit happily in classic cocktails or a sipping glass. 92 • Aperol Aperitivo Liqueur 11% (Italy) $25.00. 87 • APPLETON ESTATE Signature Blend Rum 40% (Jamaica) $21.99. 92 • APPLETON ESTATE Reserve Blend Rum 40% (Jamaica) $26.99. 90 • APPLETON ESTATE Rare Blend 12 Year Old Rum 43% (Jamaica) $37.99. 95 • APPLETON ESTATE 21 Year Old Rum 43% (Jamaica) $134.99. 94 • APPLETON ESTATE JOY Anniversary Blend Rum 45% (Jamaica) $250.00. 90 • Baron Samedi Spiced Rum 45% (Caribbean Islands) $21.99. 92 • Bond & Lillard Kentucky Straight Bourbon Whiskey 50% (USA) $49.99. 93 • Braulio Amaro Alpino 21% (Italy) $42.99. 87 • BULLDOG Gin 40% (England) $24.99. 91 • Cabo Wabo Blanco Tequila 40% (Mexico) $39.99. 89 • Cabo Wabo Reposado Tequila 40% (Mexico) $44.99. 93 • Cabo Wabo Añejo Tequila 40% (Mexico) $49.99. 93 • Cynar Bitter Liqueur 35% (Italy) $37.00. 90 • Espolón Añejo Tequila 40% (Mexico) $34.99. 82 • Espolón Blanco Tequila 40% (Mexico) $25.99. 85 • Espolón Reposado Tequila 40% (Mexico) $25.99. 92 • Forty Creek Barrel Select Canadian Whisky 40% (Canada) $21.99. 89 • Forty Creek Copper Pot Reserve Canadian Whisky 43% (Canada) $28.99. 91 • Forty Creek Double Barrel Reserve Canadian Whisky 40% (Canada) $54.99. 90 • Forty Creek Confederation Oak Reserve Canadian Whisky 40% (Canada) $64.99. 89 • Frangelico Hazelnut Liqueur 20% (Italy) $24.99. 87 • Glen Grant 12 Year Old Single Malt Scotch Whisky 43% (Scotland) $65.00. 88 • Glen Grant 18 Year Old Single Malt Speyside Scotch Whisky 43% (Scotland) $119.99. 93 • Glen Grant 15 Year Old Batch Strength Single Malt Speyside Scotch 50% (Scotland) $.00. 94 • Grand Marnier Cordon Rouge Liqueur 40% (France) $39.99. 92 • Grand Marnier Signature Collection Raspberry Peach Liqueur 40% (France) $39.99. 91 • Grand Marnier Cuvèe du Centenaire Liqueur 40% (France) $199.99. 98 • Grand Marnier Quintessence Liqueur 40% (France) $899.00. 90 • Grand Marnier Cuvée 1880 Liqueur 40% (France) $349.99. 92 • J. Wray Gold Rum 40% (Jamaica) $20.00. 89 • J. Wray Silver Rum 40% (Jamaica) $20.00. 97 • Jean-Marc XO Vodka 40% (France) $55.00. 92 • Russell’s Reserve 10 Year Old Kentucky Straight Bourbon Whiskey 45% (USA) $35.00. 94 • Russell’s Reserve Single Barrel Kentucky Straight Bourbon Whiskey 55% (USA) $51.99. 93 • Russell’s Reserve Straight Rye Whiskey 45% (USA) $59.99. 95 • Sagatiba Envelhecida Cachaça 38% (Brazil) $.00. 98 • Sagatiba Preciosa Cachaça 42% (Brazil) $300.00. 92 • SKYY Infusions Bartlett Pear 35% (USA) $14.00. 84 • SKYY Infusions Sun-Ripened Watermelon 35% (USA) $18.49. 84 • SKYY Infusions California Apricot 35% (USA) $18.49. 86 • SKYY Infusions Cold Brew Coffee Vodka 35% (USA) $13.99. 90 • SKYY Infusions Blood Orange Vodka 35% (USA) $13.99. 90 • SKYY Infusions Citrus Vodka 35% (USA) $13.99. 91 • Wild Turkey 101 Kentucky Straight Bourbon Whiskey 50.5% (USA) $24.00. 92 • Wild Turkey American Honey 35.5% (USA) $23.00. 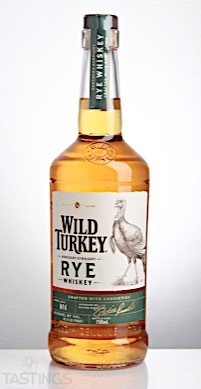 90 • Wild Turkey Kentucky Straight Rye Whiskey 40.5% (USA) $24.99. 95 • Wild Turkey Rare Breed Kentucky Straight Bourbon Whiskey 58.4% (USA) $44.99. 93 • Wild Turkey Master’s Keep Decades Straight Bourbon 52% (USA) $150.00. 90 • Wild Turkey American Honey Flavored Whiskey Liqueur 35.5% (USA) $22.99. 93 • Wild Turkey American Honey Sting Flavored Whiskey Liqueur 35.5% (USA) $21.99. 88 • Wild Turkey Kentucky Straight Bourbon Whiskey 40.5% (USA) $20.99. 93 • Wild Turkey Kentucky Spirit Straight Bourbon Whiskey 50.5% (USA) $49.99. 86 • Wild Turkey Longbranch Bourbon Whiskey 43% (USA) $39.99. 84 • X-Rated Peach Blush Fusion Liqueur 17% (Italy) $24.00. Rye Whisky must contain a minimum of 51% rye grain, be distilled at less than 80% ABV (160 proof) and be aged for a minimum of two years in new charred barrels. A small amount of straight Rye whiskey is bottled and marketed, but most of the industry production is blended into other whiskies to give them additional character and structure. Canadians frequently refer to their whisky as "Rye," though it is in fact made primarily from corn or wheat. The Taste: While the best Bourbon is known for a creamy, caramel-like palate, the best Rye whiskey makes its presence known with a spicy, grainy, hard-edged firmness that is distinctive and unique. Usually very dry, with notes of walnut, toasted grain, and black pepper, straight rye has a bold assertive character that has earned it a small but dedicated following among discerning whiskey fans. The Scotch-Irish immigrant distillers had some exposure to using rye in whiskey production, but for their German immigrant neighbors rye had been the primary grain used in the production of Schnapps and Vodka back in northern Europe. They continued this distilling practice, particularly in Pennsylvania and Maryland, where Rye whiskey, with its distinctive hard-edged, grainy palate, remained the dominant whiskey type well into the 20th century. Rye whiskey was even more adversely effected by National Prohibition than Bourbon. A generation of consumers weaned on light-bodied and relatively delicate white spirits turned away from the uncompromising, pungent, full-bodied straight Rye whiskies. Production of Rye whiskies had vanished altogether from its Mid-Atlantic homeland by the 1980s. 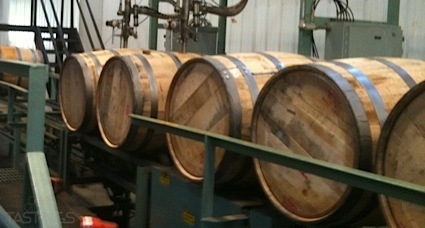 A handful of modern Rye whiskies are currently being made by Bourbon distilleries in Kentucky and Indiana. America’s first indigenous whiskey style is today only barely surviving in the marketplace. Its primary use is for blending to give other whiskies more character and backbone, although a small but vocal group of Rye whisky enthusiasts continue to champion it. Wild Turkey Kentucky Straight Rye Whiskey rating was calculated by tastings.com to be 90 points out of 100 on 9/5/2017. Please note that MSRP may have changed since the date of our review.